Elements representing North Dakota’s changing environments are showcased on the Pembina River Plaza, located at the east side of Heritage Center grounds near the Northern Lights Atrium. 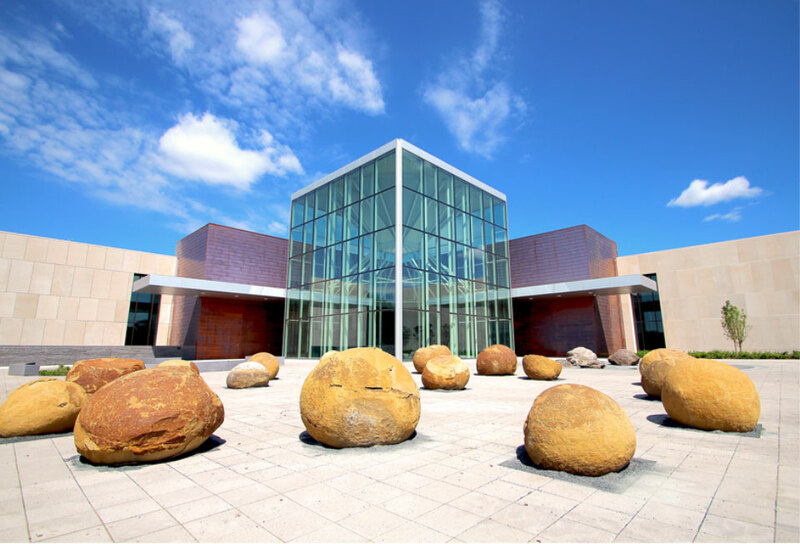 As you cross the Pembina River Plaza to enter the Heritage Center, take note of a 60 million-year-old petrified tree found on the shores of Lake Sakakawea. This meta-sequoia grew in the swamps that would form the coal beds of western North Dakota. A cluster of trees helps tell the story of the human influence on the landscape. Benches provide an opportunity to relax before visiting the museum or a place to reflect on your Heritage Center experience. A circle of 17 cannonball concretions showcases a unique geological feature. These large 56 million-year-old sandstone spheres formed in layers around an organic center, much like a pearl is formed around a grain of sand, and are the namesake for the Cannonball River. Surrounding a quiet pool of water are several granite boulders, or glacial erratics, remnants of the last glacier 12,000 years ago. The pool represents the prairie pothole region, the rich bird habitat that makes North Dakota a destination for bird watching and bird hunting.